If you're on a budget or simply don't like being wasteful, then why not make your own recycled art supplies? Getting your children interested in art from an early age is a must. Children will not only have hours of fun and enjoyment from art and craft activities, but art is also a great way for them to explore a new avenue of expression. Your local art store will of course be packed to the rafters with art supplies - from expensive crayons, chalks, pastels, paints to art pads and books. But you needn't spend a fortune, as there are many ways to find 'free' art supplies, or simply find new life in old art materials. If you or your children use wax crayons, then you may find that you have lots of broken odds and ends lying around. Quite often, the small stubs of wax crayon are too small to work with. However, if you have lots of small stubs, it seems such a shame to throw away what could become perfectly workable crayons! 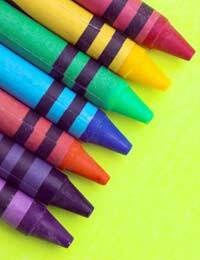 The easiest way to recycle the crayons is to load them into a baking tray. The tray should have small 'modules', where you would usually bake tasty treats such as muffins or fairy cakes. Each module can be filled just below the rim with broken crayon ends, taking care to remove any paper labels from all crayons. You can either fill each module with the same colour crayon, or for a more interesting take why not put lots of different colours in together to create a multi-colour crayon?Once you've loaded up your crayons, you can then place the baking tray in the oven. The oven only needs to be on a low heat, so that the crayons gently melt and merge into one another. The baking tray can then be removed and left to cool, before removing the new crayon discs. You don't have to be restricted to using a standard muffin baking tray. Why not go for interesting shapes like hearts or stars? There are many different shapes of cake baking tray available, all of which can be used to make your own fun shaped crayons. If you'd rather go for a more traditional shape, you can simply remove the crayons whilst they're warm and malleable, and cut into long strips (similar to chalk pastels) before leaving to cool completely. You can make your own recycled art materials by collecting odds and ends such as bottle tops, paper, thick wool or yarn, even shaped pasta! These sorts of materials are great for art and craft projects such as collages. For mosaics, you can source all sorts of paper. Old ends of wallpaper, last few sheets of coloured paper pads, magazines, direct mail, flower cellophane wrapping, old gift wrap and tissue paper can all be collected and recycled for use in paper craft projects. The paper can also be cut into regular shapes such as squares or triangles, and categorised by colour. Newspapers can also prove an excellent recycled art supply. Not only can the large headline letters be used, but the newspaper itself can be cut into strips for use in projects that involve weaving or papier mache. Older children could try working with recycled supplies such as garden wire to create interesting sculptures. However, because the wire can be sharp, this should always be done with parental supervision. There are a plethora of potential art supplies out there, and using recycled materials means that you will save money. Using recycled art supplies also saves on using extra resources and manufacturing processes. In addition, your children will also learn to come up with creative ways to use different materials and explore various art skills.